Following the death of his former mentor, Picard launches the Enterprise into an archaeological mission with profound implications for all life in the galaxy. There Picard goes again, handling rare and ancient artifacts with his bare hands. This is the third Picard-centric episode in a row, and the fourth in six episodes. Why, aside from the obvious plot convenience, did the Yridian ship explode when Worf fired on it? I'm not a molecular biologist, but I'm fairly cetain that no significant piece of DNA can survive the evolutionary process for over 4 billion years without mutating beyond all recognition. Do Klingons actually bake biscuits? I love the bit in which Data totally beats the Klingon challenge, with apparently no effort. The Klingon captain agrees to go with the Enterprise without even bothering to tell his crew that he's leaving them behind. The code "reconfiguring" the tricorder and transmitting a holographic message that all four alien races can understand is painfully convenient. There are a lot of things I like about this story. For one thing, the theme (complete with the slightly over-hammered motif of the nesting statue) that each of us are made up of bits and pieces of other people and thus we are all parts of each other is very Trekkish, and this feels like an idea saved from the cutting room floor of TOS. 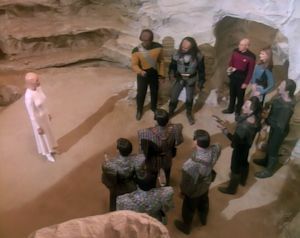 It's also epic in scope and tries to address a narrative problem in the Trek universe, namely why all the major alien races look so similar to each other, but it doesn't sacrifice a more personal story for Picard. At the planning stages, this had the makings of an amazing episode. Unfortunately, the science isn't fully thought out, the personal story has no payoff, and the plot is full of unexplained conveniences and sloppy coincidences as a result of its rushed pace. This is an episode that needs to be a two-parter, and if it had been, it had the potential to compete with "The Best of Both Worlds." Unfortunately, as it stands, it is an unfinished, hurried mess. When Picard gets angry at Troi in his ready room, it reminds me of his Captain Ahab speech from Star Trek: First Contact.